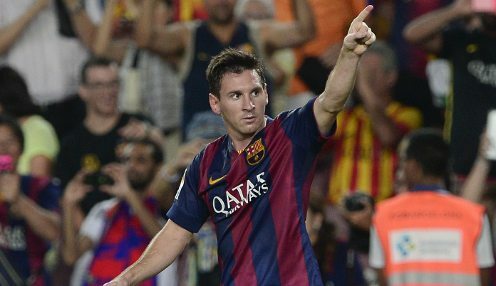 Lionel Messi scored his 24th La Liga hat trick against Rayo Vallecano on Sunday. Barcelona scored five second half goals in a 6-1 win over Rayo Vallecano to secure top spot in La Liga. The Catalan giants led 1-0 at the break courtesy of a neat finish from Louis Suarez, who has started to find the net more regularly in recent weeks. Gerard Pique scored after the restart before Lionel Messi took charge with a hat trick inside 12 minutes at Camp Nou. The Argentine star scored from the spot on 56 minutes, poked home his second and Barca’s fourth and completed his hat trick in impressive fashion in the 68th minute with a well taken effort. Dani Alves was sent off for the home side late on and Alberto Bueno pulled a goal back for Rayo from the resulting penalty, but Suarez scored his second of the game in the closing stages after being set up by Messi. Barcelona now have a one point lead at the top of the La Liga table after moving ahead of Real Madrid. Defending champions Atletico Madrid are eight points adrift of Barca but they can reduce the gap to five if they beat Valencia at the Vicente Calderon on Sunday. Barcelona are 1/1 to win the Copa del Rey and 1/1 to secure the Champions League title.